This is a direct Replacement for your Verizon FIOS. We will send you (1) 12 Volt 7Ah/8Ah/9Ah . I like to take a photo of something before I uninstall a part, then I know what it should look like when I am putting the new one back in. Replaced my verizon fios backup battery with this one. Plugged in easily with old plug removed from previous battery. 0 problems. Was shipped surprisingly fast. As advertised. Fit's perfectly. 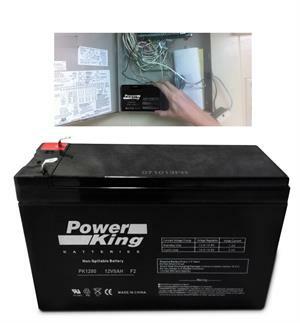 Easy install..
Great reasonably priced alternative to other suppliers of this battery. Works just fine! Great! Verizon wanted to charge us $49 for the exact same thing. Good price; easily fit into the Verizon box. Worked like a charm and more than half off the price cable company was charging. Simples to install. Will buy it again when this one runs out. Excellent value, half the price of the "official" replacement from Verizon. Very good instructions to replace, easy! Glad to have the beeping stop, how annoying, Verizon! The right size, the right power, the right price. This Fios replacement battery was a perfect fit; even the terminals were correctly positioned just like the original. The rated AMPs per hour were the same. The price was much lower than having Fios install a new battery. Works perfectly, easy to install and no more the annoying beeps from the old battery. I would definitely buy this again.